My mother and I were just having a conversation about not using plastic anymore in her lunch box to work. After all these studies that show that some plastic cause cancer and other problems, whether it is true or not, it is smart idea to start avoiding these plastics. U Konserve was nice enough to send us their new glass rectangle container with silicone sleeve. It goes into the microwave, the oven, and the top rack on the dishwasher. Also, everything is BPA-free, PVC-free, phthalate-free and lead-free! Glass containers and silicone sleeves are oven safe up to 375 degrees, microwave safe (remove lids before placing in oven or microwave), and dishwasher safe (top rack recommended). Although the lids are dishwasher safe, research has shown that it is best to keep plastics out of high temperature environments like microwaves and dishwashers. Silicone grip helps prevent breakage and protects hands from hot surfaces, but as with any glass product or hot surface, please use common sense when heating, storing and handling. As with other glass products, avoid extreme temperature changes (freezer to oven, for example) that will crack the glass. Handle with care when using as bakeware. 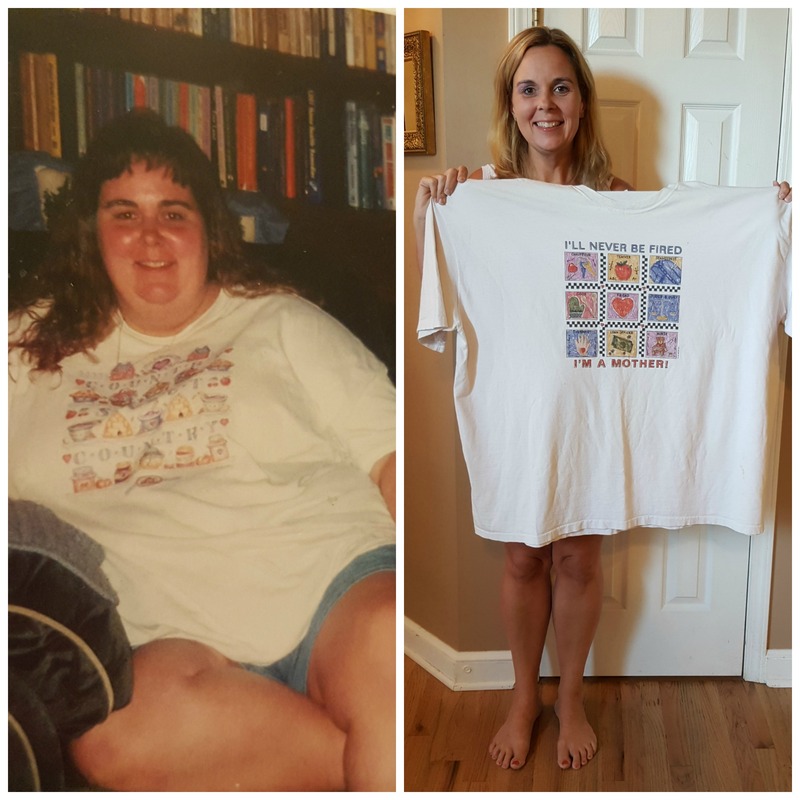 The one in the photo is 36oz. and measures 8” x 5.75” x 3” tall. U Konserve also has a 13 oz. one. The next piece that U Konserve sent was this large round container in neon pink. Container is 304 (18/8) food-grade stainless steel. Lid is non-toxic LDPE #4 plastic. Next up, we have the insulated lunch sack. The ultimate in recycling and reuse! 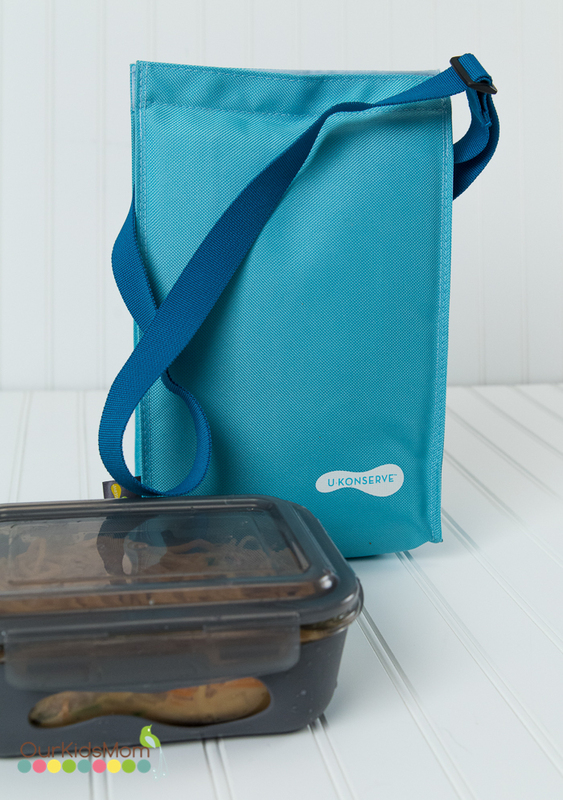 The reusable insulated lunch tote with adjustable strap is made from recycled plastic bottles. There is an inside pocket for an ice pack, utensils and napkin. 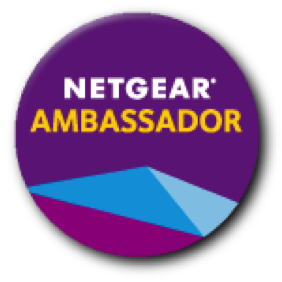 It is extremely durable and machine-washable! Bag and strap made from 100% non-toxic recycled PET #1 plastic bottles. Insulation is non-toxic PE #1 plastic. Lastly, we have the Ice Pack & Sweat-Free Cover. The non-toxic gel pack comes inside a cover made from recycled plastic bottles! 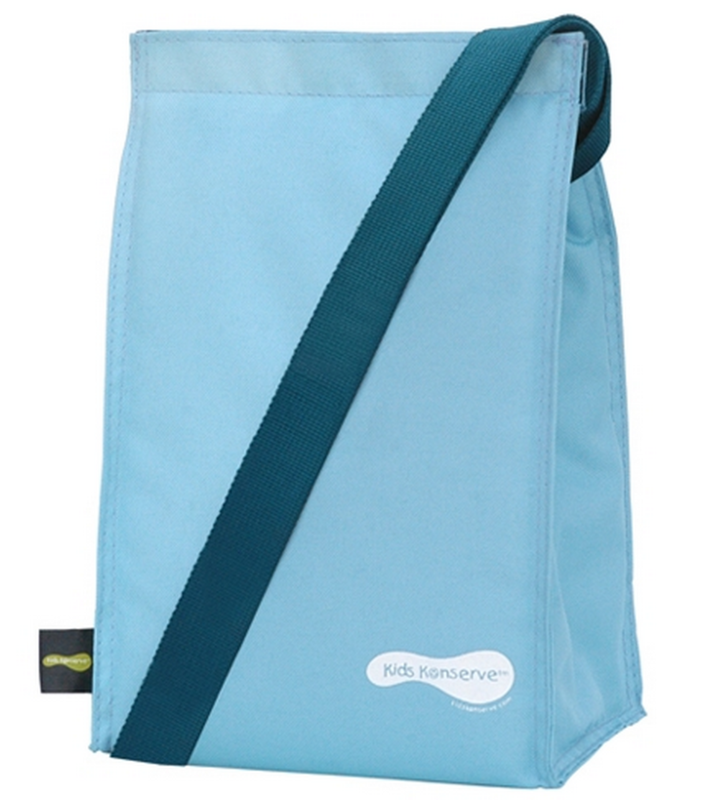 The ice pack fits perfectly on the bottom of the insulated lunch bags and cotton sacks. 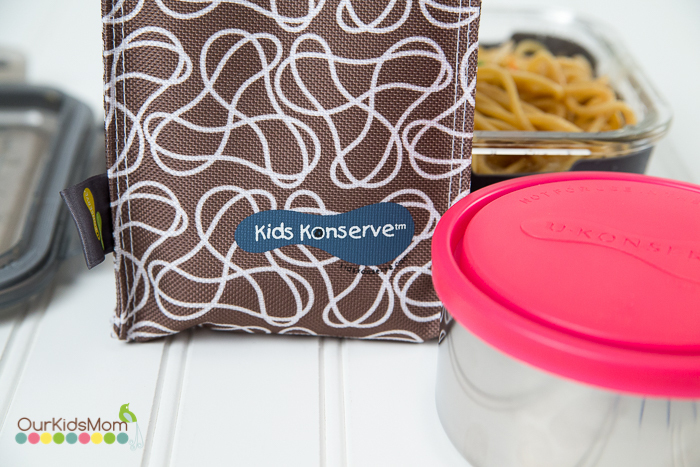 All of it is BPA-free, PVC-free, phthalate-free and lead-free! The cover is machine washable, and can be removed by opening Velcro closure. Works best if gel pack is kept inside sweat-free cover when freezing. Cover is made from 100% non-toxic recycled PET #1 plastic bottles. Gel pack is made of a non-toxic sodium polymer. U Konserve is making it a little easier for us to be a little more green. 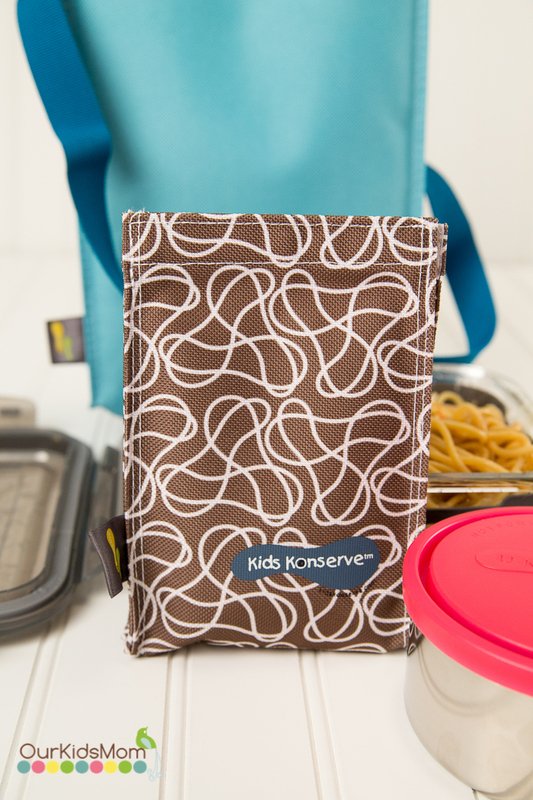 ONE OurKidsMom reader is going to win a reusable lunch sack! This giveaway ends at 11:59 PM EST on January 14, 2015. I love that these are non-leaching alternatives to plastic containers! I love that the containers are oven safe. I like that the ice packs have sweat-free covers. I hate it when I bring a lunch and everything is wet because of the ice pack sweating over everything. I like how affordable they are…it would be perfect for a child’s lunch and my own lunch. 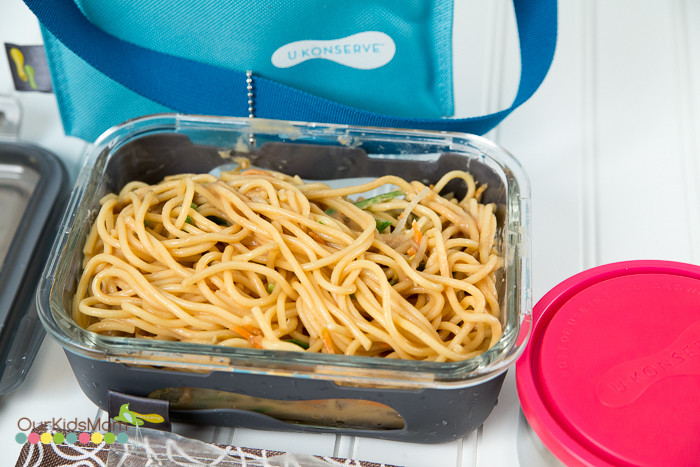 I like the U•Konserve Lunch Kit – Slate. I like the Ice Pack & Sweat-Free Cover – Sky. I would love to have the Ocean Clear Food Kozy® Wrap. Really I would love to have any color! I learnt that the bad only costs $19.95. I like the Butterfly Waste-Free Lunch Kit, it would be great to have or give as a gift. I like that there is a pocket for an ice pack. Some lunches simply have to be kept cold. I also like the Ice Pack & Sweat-Free Cover – Green. I learned you can add an ice pack to this insulated lunch pack. I am loving the Glass Rectangle with Silicone Sleeve – 36oz – Eggplant! Love the container and love the color too! love that the containers are oven safe. 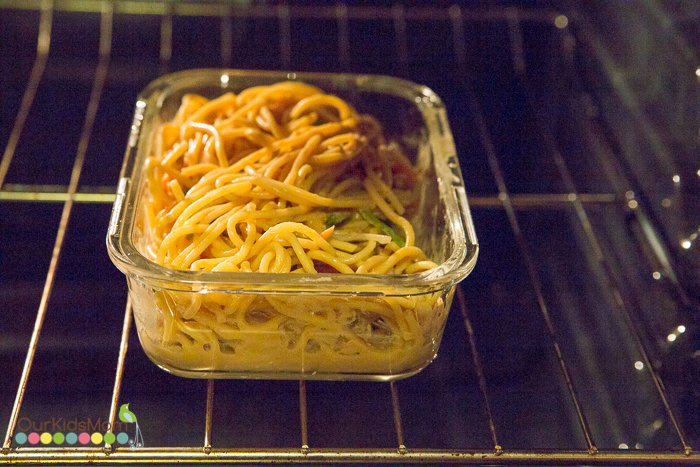 I love that the containers are oven safe – so much easier than making extra dirty dishes! I entered the Winter Car Care giveaway. Its very easy to wash and reuse. I love that. I would love to have the Glass Bottle with Silicone Sleeve – 20oz – Eggplant! I’d like to have one of the Ice Pack & Sweat-Free Covers to keep my food cold but dry. I’d really like the Ice Pack & Sweat-Free Cover – Magenta!! 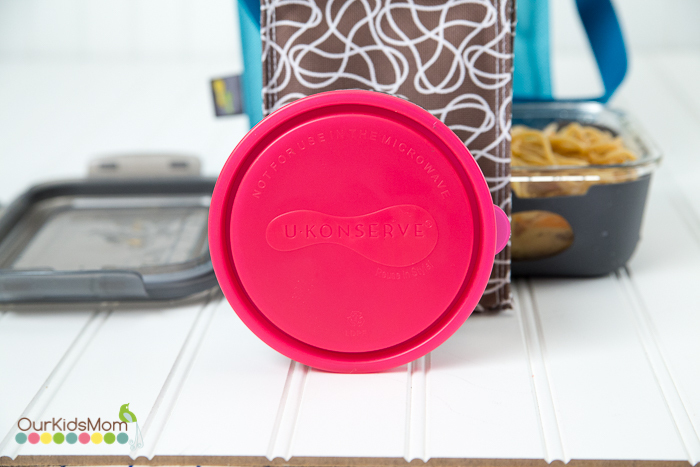 I really like the U•Konserve Lunch Kit – Saffron. 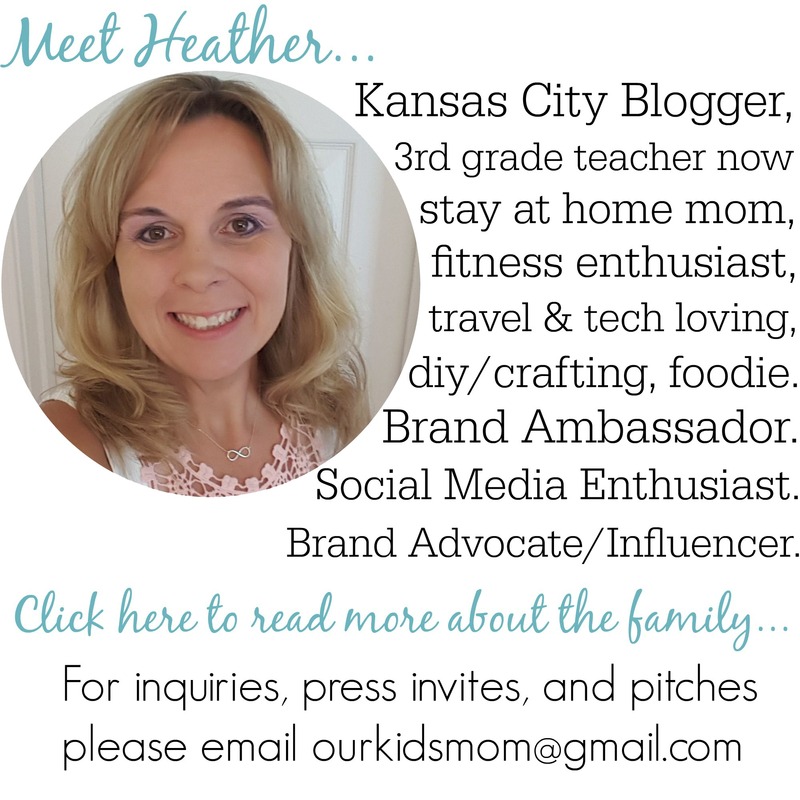 I pack four lunches every day, one for each of my three children and another for my husband. 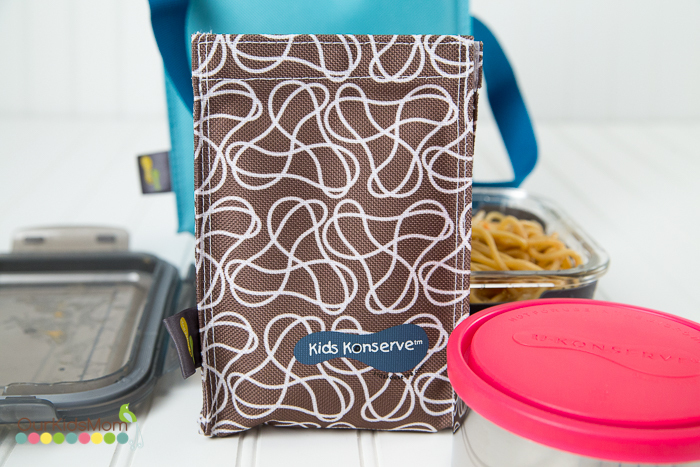 These containers and lunch sacks would be great for sending my family with leftovers!